Arsenal football club has signed a sponsorship deal to promote Israel as a tourist destination from next season. The two-year, £350,000 agreement will see Israel being promoted on pitch-side billboards and TV screens at Arsenal's new Emirates Stadium in London. Arsenal said it had cleared the deal with officials in the United Arab Emirates, whose national airline bought the naming rights to the new stadium. The United Arab Emirates does not have diplomatic relations with Israel. Arsenal's managing director, Keith Edelman, announced the deal on Sunday after a meeting with Israeli tourism minister Abraham Hirchson. "We think football is a great product and we think it will assist Israel become a more popular destination," Mr Edelman said. Mr Hirchson said the tie-up would allow Israel to promote its tourism industry to millions of football-lovers around the world. 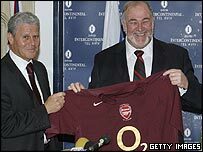 It is thought that the agreement will enable Israel to use likenesses of Arsenal players in its own promotions. "The purpose is to broaden Israel's appeal to sun and fun-seekers," said tourism ministry spokesman Jonathan Pulik.